These wooden train tables are perfect for building your track and sets on without having to lay it out all over the floor! Complete with wonderful designs for adding more realism and excitement to the train set layout and some come complete with drawers for storing the track and trains inside! 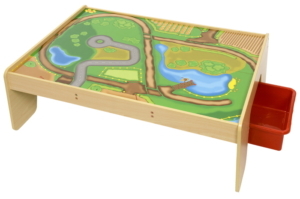 Made from high quality materials these wooden train set tables are a great addition to any child’s playroom or bedroom.